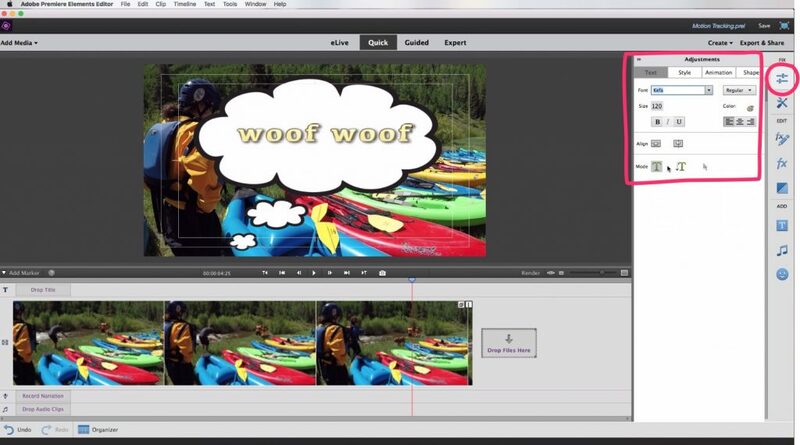 Motion Tracking in Adobe Premiere Elements is a fun feature that looks impressive, but it’s actually really simple! The Motion Tracking tool allows you to add a graphic or object to your video clip, and then select how that object moves (or tracks) based on moving objects in your clip. 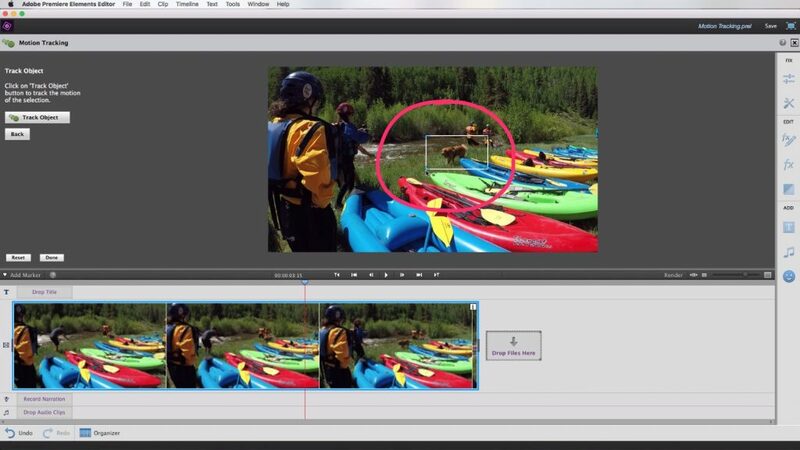 It’s much easier to see in action, so I’ve partnered with Adobe to bring you a complete tutorial on Motion Tracking in Adobe Premiere Elements 2018. 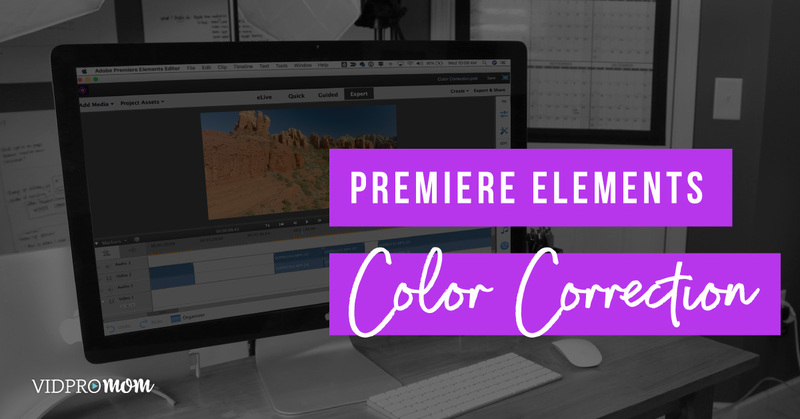 If you haven’t checked out Premiere Elements 2018 yet, you can download it here and give it a try (free) for 30 days! If you’re totally new to Premiere Elements and video editing in general, I have a cheat sheet for you! Click here to grab the cheat sheet now. For more tutorials and how-to videos, be sure to subscribe to the VidProMom YouTube channel as well. 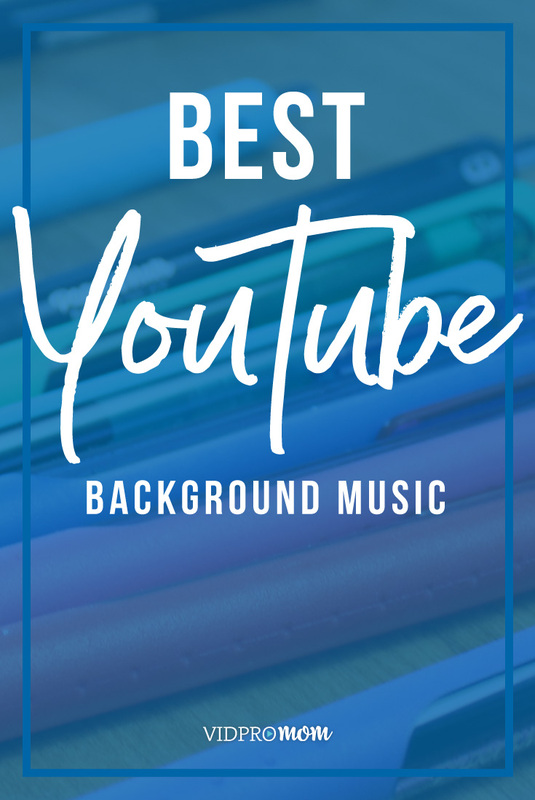 This tutorial works with any kind of video footage, whether it’s just for fun family videos or for your YouTube channel. For this tutorial, I am using a short clip from my GoPro that I tool on a recent trip to Vail, Colorado. I’m going to use this clip for motion tracking because Kicker (the dog) is walking through the frame a little bit and I’m going to give him a moving speech bubble! So the first thing you need to do, once your clip is on the timeline, is to select it and click the Tools icon on the right-hand side. Once you do that, you’ll get a menu with several Tools, and about halfway down, you’ll see Motion Tracking. After you select the Motion Tracking tool, you will see helpful instructions on the left-hand side that explain exactly what to do to use the Motion Tracking tool. The first step is to select the object in your clip that you want to track. In this case, I am tracking Kicker. Next, adjust the size and placement of the selection box so that it’s surrounding the moving object. In this case, I made my selection box a little smaller so Kicker was inside the box. Once you’re happy with your selection, click the “Track Object” button on the left. 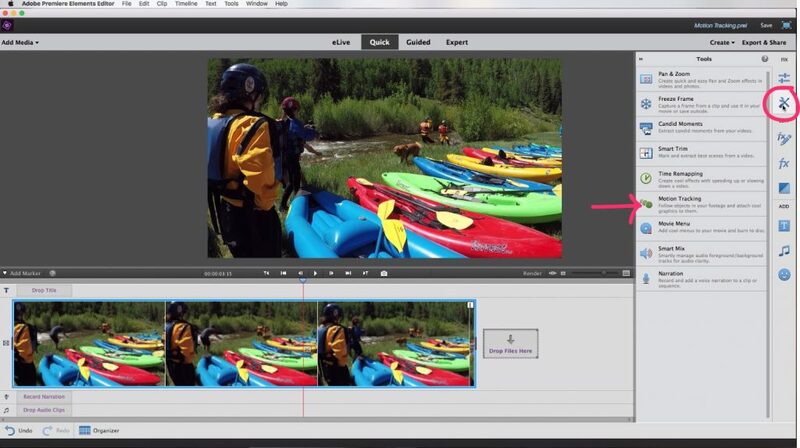 Premiere Elements will analyze each frame to determine where that object starts and ends in the frame. So, in this case, Kicker is just walking along the grass. Premiere Elements is automatically going to create a path based on his movements. Once the clip has been analyzed, you’ll see a Graphics menu on the right. This is where you’ll choose a graphic or speech bubble to “track” along with the object you selected. I chose a thought bubble because I think that’s a fun one for a dog! To select a graphic, just click it and drag it over to your preview window where you made your selection box. If you choose a speech bubble or thought bubble, Premiere Elements will give you a popup window to write your own words in the bubble. You can change the words and style later. You can resize the graphic and choose the exact placement, then move the time indicator bar slowly along the timeline. You should see that your graphic follows the path of your selected object. Next, you might want to change the words or styling of the words in the thought bubble. To do that, start by selecting the bubble graphic in the preview window. Next, choose the little slider button under the “Fix” menu. You can change your text directly on the bubble graphic, or use the menu to adjust the font, color, and size. One thing I want to mention is that while the Quick editing mode in Premiere Elements is simple and easy, the graphics available are limited. To utilize more graphics options, select Expert editing mode. Be sure to watch the full tutorial here to see how to use motion tracking in your own projects. 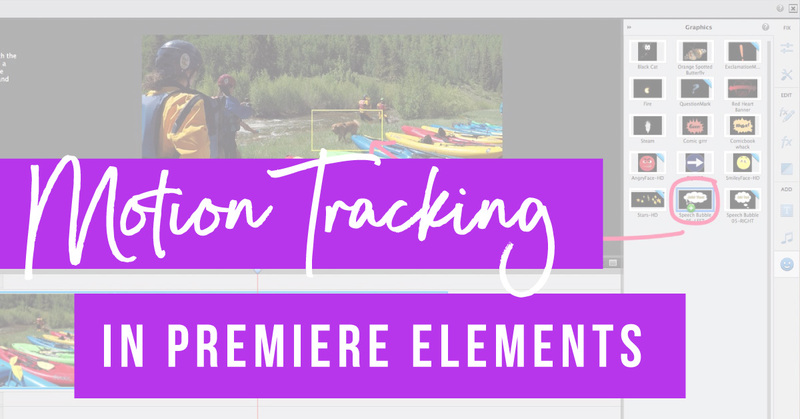 Motion Tracking is a fun and interesting way to enhance your videos using Premiere Elements 2018! If you haven’t downloaded Premiere Elements yet, or haven’t upgraded to the 2018 version, you can get a 30-day free trial here. I’ve been using GoPro editing software, but now I need to do more precise editing. GoPro will not let me flip an image 90 degrees, nor will it let me use audio only from a video clip. Will Elements solve my problem(s)? Thanks a lot for your tutorials and help!